Join us here at Mystery Lovers' Kitchen in welcoming guest Kathy Aarons, author of the Chocolate Covered Mysteries, who brings us a very special treat today: a chocolate truffle recipe! People think that writing the Chocolate Covered Mystery series means that I know how to make truffles. I certainly didn’t know how at the beginning, but I (kind of) do now. 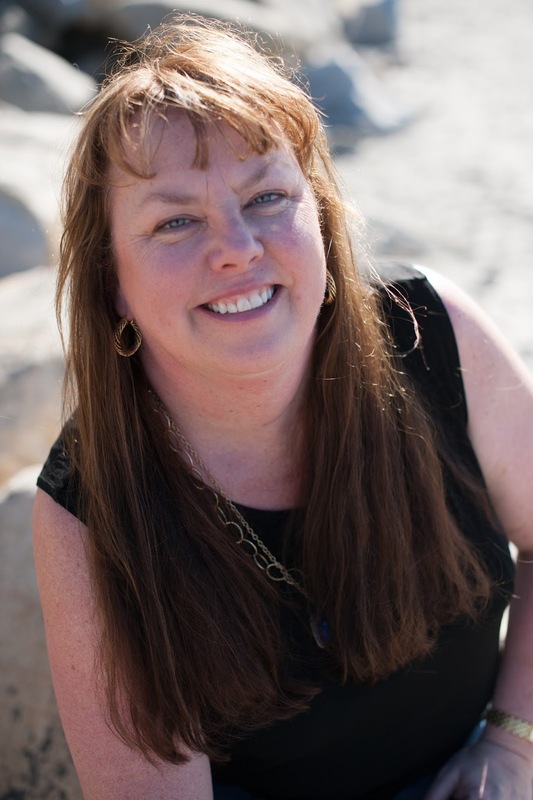 Luckily for me (and the readers), the recipes are provided by a real chocolatier -- Isabella Knack, owner of Dallmann’s Fine Chocolates in San Diego, California. She creates gorgeous works of art that taste amazing. Unfortunately, I just have to test all of the recipes in the books. I have no choice – it’s in my contract! Even after all of my testing, my truffles end up being little ugly lumps, but they are still delicious. 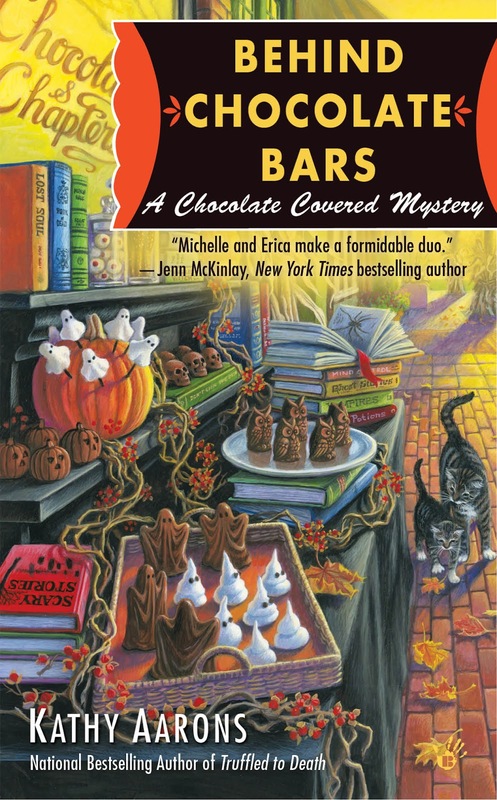 This recipe – Irish Cream Ganache - is in Behind Chocolate Bars, the third book in the Chocolate Covered Mystery series. I took photos as Isabella made them in her work kitchen. The recipe is a little different at the end – she put the ganache in beautifully air-brushed chocolate instead of premade chocolate molds. But the end result of both is sheer delight. A. 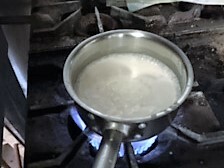 Combine the heavy cream and glucose syrup in a saucepan and bring to a boil. 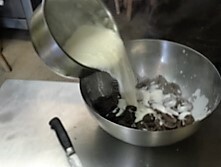 B. Pour the hot cream mixture over the chocolate and let sit for 2 minutes. 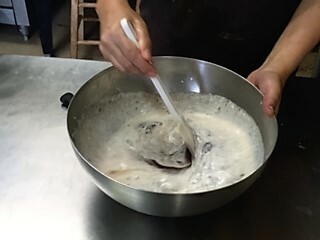 C. Using a spatula, stir the mixture in small circles of the bowl until it emulsifies. D. Stir the soft butter into the ganache until it’s incorporated. E. Add the liqueur, stirring until the mixture is homogeneous. F. Pipe into premade chocolate molds. They sound delicious! Good luck! Hope you enjoy the Halloween theme! Good luck! The revipe sounds so doable for someone that has never made candy! I may give it a try. I am definitely going to read this series! Love chocolate!!! Even I can make these! Good luck! So glad you enjoy them! Good luck! Thanks for sharing with us today! Such a generous giveaway to let the winner choose which book in the series they want! 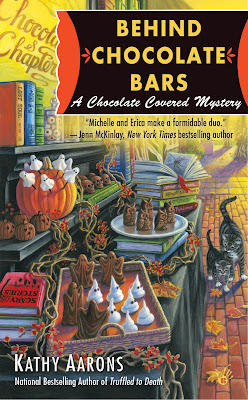 I love the Halloween goodies on the cover of the new book. The cover artist is awesome! Good luck! Recipe sounds wonderful, as does your series - which I haven't read YET! By using a chocolate mold you don't have to think about lumpy shapes. So glad you like the series! Good luck! This is a new series and author to me and I can't wait to read this series. Especially, for the recipes. Can't wait to read. Thank you for the chance and love the series so far! !